Vaya, a Chennai-based company offers innovative lunch boxes that make for great storage and look super elegant. They also have a range of other products such as containers, cutlery, sippers and more. Ever heard of designer lunch boxes? Believe us when we say they exist. 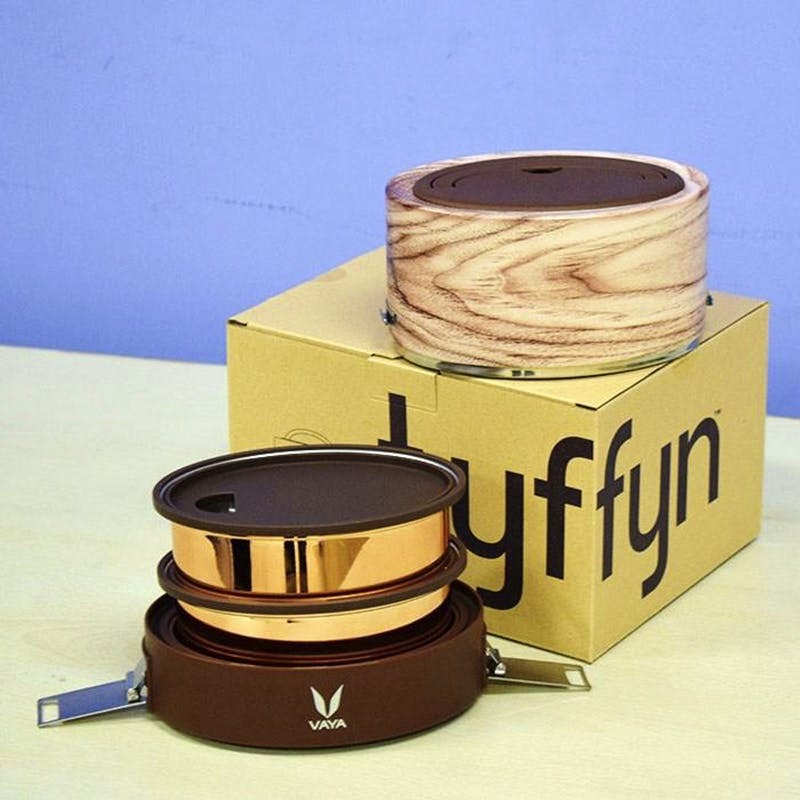 Sleek, compact and beautiful looking, Vaya’s lunch gears called Tyffyn, are exactly that. Built to maintain freshness for up to 6 hours, their lunch boxes range from solid metallic shades to printed metallic boxes (the ombre ones are simply gorgeous), with a storage capacity of 600 ml and 1000 ml, starting from INR 2500. They also have TyffynJumbo, which consists of 4 containers that offer a storage capacity of 1300 ml and are priced at about INR 3600. The containers inside the lunch box come with a partition and can be used as stand-alone containers. Cool isn’t it? Not just that, they also have a special kiddies lunch box line that includes prints like bunnies, cats and dino, priced at about INR 2400. Vaya has also collaborated with Disney and has launched lunch gears carrying characters from Captain America, Marvel, Mickey and more. You can even dress your lunch box with their bag mat which serves as both a cover and a mat to place your meal on. Besides lunch boxes, they also have a line of sippers that can be used for juices and hot beverages called Drynk. You can pair it with a blender ball that is great for shaking up those smoothies. If you’re looking for kitchen storage, you can check out their Preserve line that includes containers offering a storage capacity of 300 ml and 500 ml. Starting from INR 1290, these are available in shades of gold, purple, black and graphite. They are currently running a sale on their website, so be sure you shop with them now.